Finally ! a good adaptation of Puzzle Bobble, one of the most addictive Puzzle Action game is now available FREE for the Android market. 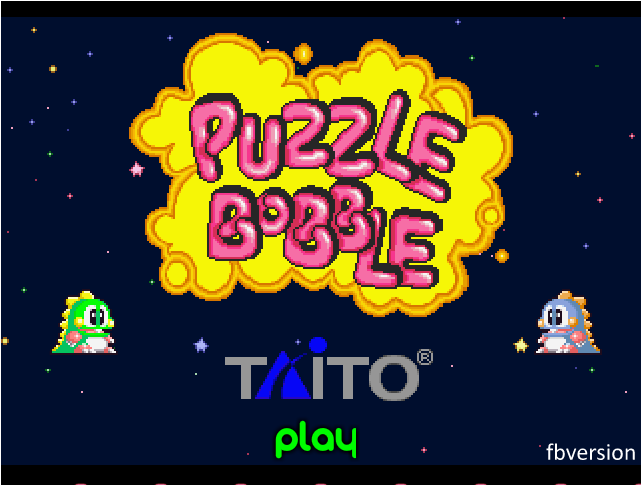 This version is NOT the original game from the 90s, but has been beautifully adapted and freely inspired from the old classic Puzzle Bobble.. This is a must have for all fans of the bubble games genre on this platform. HOW TO PLAY : Your goal is to remove all the bubbles from the playing area. 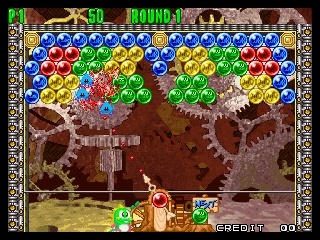 You have to form clusters of the same colored balls (3 minimum) to blow them up, and prevent the balls to come down and reach the ground. Dont worry, Bob the dinosaur will help you… Hes always at your order and ready to operate the cannon ball. To launch the ball, just touch the screen on the direction you want the ball goes, and Bob will shoot the ball for you in that direction. The cannon always shows the color of the next bubble you are going to shoot, so you can plan ahead before shooting. You dont necessarily have to blast bubbles on each shot, planning ahead can be real necessity in this game. Also, if you shoot a bubble towards an exposed wall, it will not stick to the wall but will bounce right back. This feature can be really helpful when the center of your screen is filled up with balls. Sounds easy ? Rest assured that people are spending hours and hours blasting those bubbles ! Its so addictive, fun and challenging ! Featured in this Free Puzzle Bubble version : ＊ 1000 challenging levels ＊ Colorblind mode ＊ automatic saving your progress in the levels ＊ special mode for those who do no want to be hurried ＊ Unlimited fun and addiction ＊ The best bubble game ! Please be informed that the game could display push notification ads at some times.